A little about "All Other Engines"
When you begin to collect anything, be it coins, stamps, baseball cards or something as off the wall as toy steam engines...you don't have much direction and sort of try this and that 'til some pattern of interest emerges from the fog. I'm no different than most toy steam collectors in this regard, but after 16+ years (as of 2018) of active scrounging on eBay primarily, I've "narrowed" my interests to select engines from Jensen, Karsten Gintschel, and Stuart . These are makers of engines represented by their own section (tab) on this website. I've also added an electric train section in 2010, so I'm branching out a bit from steam alone (I grew up with electric trains which preceded my steam interests). Around 2013 I began a number of clocks, watches and blackpowder cannons...all of which I have included tabs on my websites opening page. This tab is the "All Other Engines" section of the website currently inhabited by 16 engines and several cool accessories (Dec. 2018). A place where just 1 or 2 examples from multiple makers have found a home arranged from oldest to newest . Some maker's names you will recognize, others not likely. Each of these engines is a survivor, an engine that did NOT make a return trip to eBay after running, scrutinizing and/or staring at it on the shelves. Something about each enamored them to me and made them keepers. You will also notice a growing number of machinist built engines as opposed to the mass marketed pieces. My collecting has matured over time and I have come to appreciate the quality you get at the hand of a good machinist. Though listed in the index above, my Fleischmann 122/3 is not displayed in this section, instead it has a place of honor on the Home page right up front. My sole Fleischmann was my first steam engine and it still looks and runs like it did when I got it new in 1961. 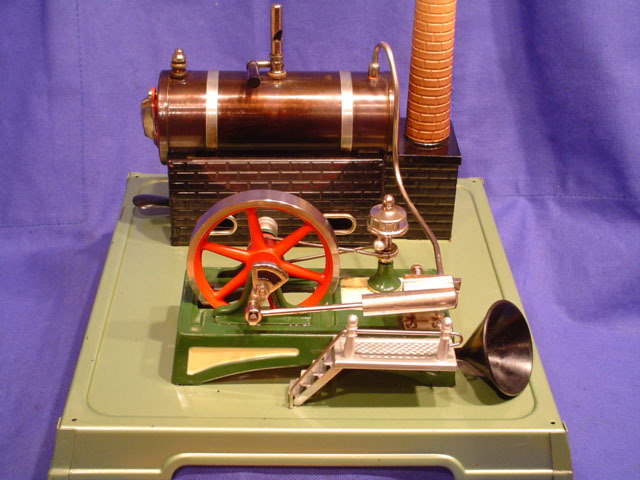 To other toy steam collectors, I "think" you will see a pattern overall and agree that given the many, many makers, countries of origin and more than 100 years of offerings to choose from, I have indeed created at least some focus. That's my story and I'm sticking with it !! 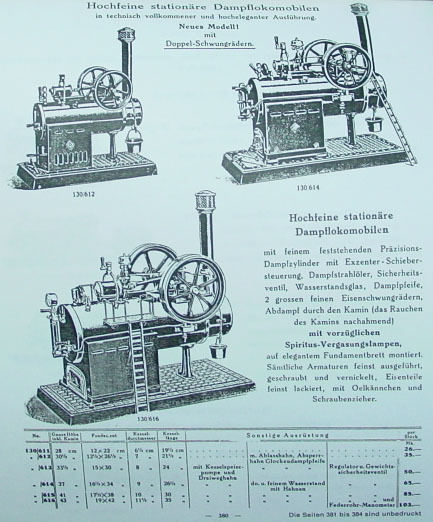 As compared to typical stationary engines with the engine separate from the boiler/firebox, I "think" an overtype is perhaps more efficient at keeping steam lines short and hence more energy going into the operation of the engine and less into global warming. I decided I wanted just ONE good example of an engine that originated from Nuremberg, Germany, when and where the toy steam art form was at it's peak. This piece has nicely satisfied that need. I have had difficulty with an exact identification of this engine and timeframe for it's manufacture. One key source felt it was a "Stationaire Lokomobile" model #130/605, possibly made between 1918 and the early 1920's. The small silver logo on the side of the firebox has "BW Germany" stamped on it. Per John O'Rear's excellent website, detailing Nuremberg engines, the company was renamed from Gerbruder (Brothers) Bing, to Bing Werke in 1918 upon the death of Ignatz Bing, one of the founding brothers. Thus, this engine bearing a BW logo would logically be a 1918 or later engine. The BW Germany designation is a unique twist vs. BW Bavaria which was more the norm, John has surmised it was possibly intended for a U.S. market more familiar with the country of Germany than Bavaria. This page would identify my Bing as being a model #130/612 with two minor discrepancies...firebox in pic on this page shows 7 vertical slots (mine has 6) and shows a diamond shaped logo on firebox while mine is square...details, details!!! So...is it a #130/605 or #130/612...I don't know for sure, but I think we're close and 1918-early 1920's time frame seems right. The construction of this engine seems heavier than the norm. The green engine frame is a heavy brass casting and there are proper brass bearings on the crankshaft that exceed what I have seen on a number of other Bing and Doll overtypes. If truth be told, this is a perfect example of a pretty face that swayed me. I bought it off eBay in Dec. 2005, direct from Germany and via an auction written in German (thank you Babel Fish translator)! I was smitten the first time I saw it, though fully aware it had undergone a complete restoration. Being a restorer myself, I was quite impressed with the quality of the work by whomever undertook it. Restoration of the paint, pinstriping and lithograph base was well done, but it came with a heavy custom turned brass chimney that was completely wrong for this engine. I made up the chimney seen here to the proper tube dimensions and capped it with a brass Mamod stack piece which fit perfectly. The chimney is obviously NOT correct in this configuration, but until I find the proper finial for the top or better still an original chimney, it will do nicely and is a whole lot closer to the original than what came with the engine. The sketch in the Bing page shown above gives a good idea of what the original chimney would have looked like. I believe the basket part at the top was done by "metal spinning"...an almost lost art. I shall have to keep looking!!! When I compare this engine to my 1961 Fleischmann, it is interesting to see the genetic link in a little thing like the outer metal sight glass protector, they are virtually identical yet made about 40 years apart. Fast forward from Dec. '05 to Oct. '06 and I have finally fired up this shelf queen for the first time since getting it. She took some tweeking of leaky gaskets and the slide valve needed adjustment, but it soon burst to life and ran exceptionally well. Under the chimney was an originally installed condensate drain tube with a little hook on the end. I envisioned a small bucket hanging on that hook that got lost along the way much as chimneys have a habit of doing. My wife being a doll collector offered up a little metal bucket that seemed to be custom made for it. The engine now looks whole again and the bucket will hold about 5 minutes worth of chimney condensate before needing a quick emptying. I've enjoyed watching this engine run for repeated firings now and I can see how a guy could get hooked on collecting Nuremberg engines. They are a departure from the "tank like" toy steam pieces I usually gravitate to, showing I have a touch of right brain admiration for art...well, mechanical "art" at least. Fortunately this pretty face is also built well and without question now holds down the spot for both most attractive engine and oldest engine in my collection. A grand old dame indeed. Although fully restored, I think the brothers Bing would approve of their offering being given a new lease on life and would probably be amazed to think their creations live on nearly a century later. Thanks guys, nice piece of work! 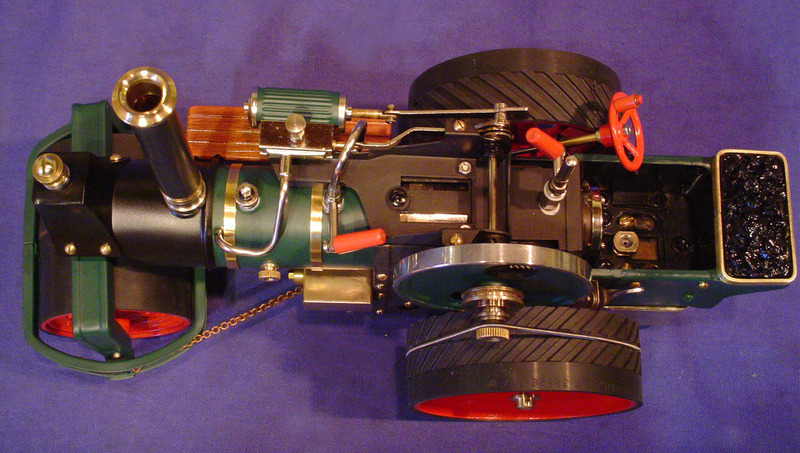 The Empire cast iron based engines are a close favorite to my Jensens, with similar "tank-like" construction. Unfortunately there is much less history, folklore and data available on Empires compared to Jensen. 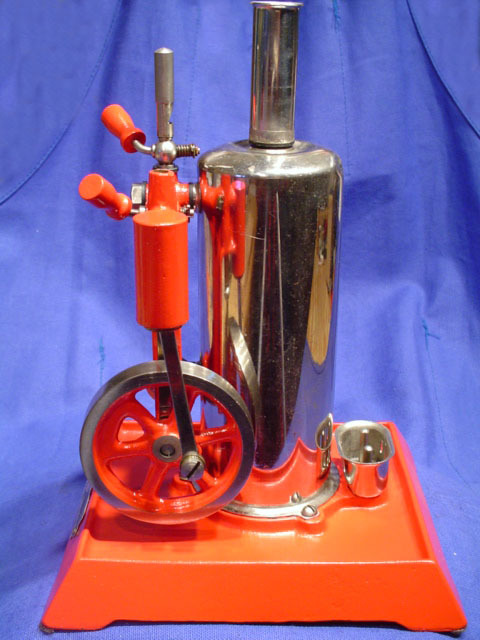 Empire's parent company Metal Ware Corporation of Twin Rivers, WI U.S.A. went out of business in the '60's, having made all manner of steam engines, steam accessories and other toys since the 1920's. One gentleman named Don Stilson has done a yeomans job of accumulating, photographing and publishing more information on Empires and the Metal Ware Corporation than anyone I'm aware of. 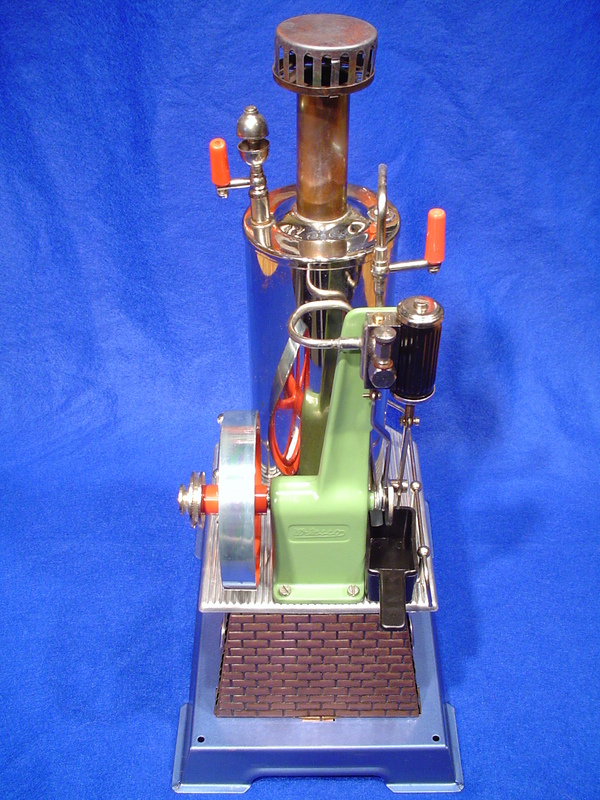 Don's Website (link seems to have gone dead May 2011) features his own significant collection of steam toys and he can be contacted via the website about purchasing his superb Empire book published in 2005. 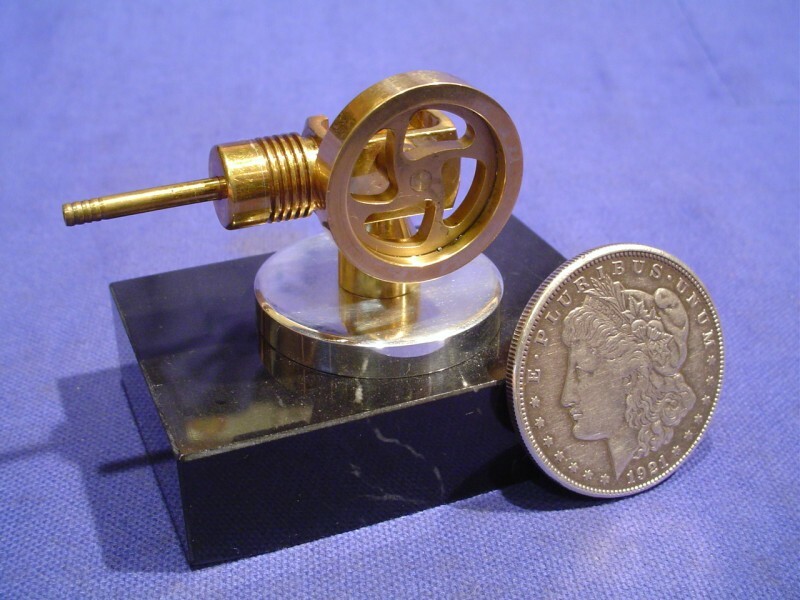 Don is also the only source I am aware of for a limited group of Empire replacement parts such as chimney stacks, whistle tops and wood knobs which are often found missing on eBay or attic finds. I've bought all from him and the quality was top notch. email: dstilson@rochester.rr.com If you need parts or his book, hopefully you can reach him. My interest in Empire relates solely to their toy steam engine and accessory line, further refined to their four cast iron based engine models. 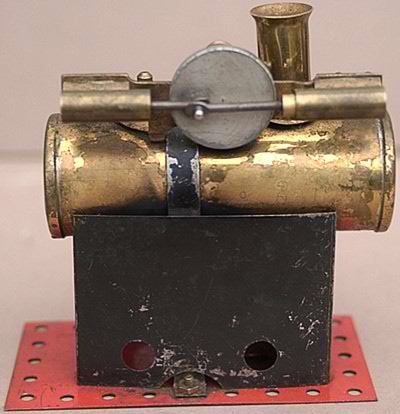 Empire also made a number of pressed sheet metal engine models, but as I have learned quickly, you have to focus, or pursue the impossible task of trying to collect everything. Finding all four cast iron based engines wasn't too difficult with the help of eBay where I picked up three and a private collector sold me the fourth. All four were electrically heated and include the B-30 horizontal, B-31 vertical, B-35 turbine and B-42 twin boiler-twin cylinder. I have restored all. UPDATE January 2015...I have sold the B-42 and B-35...retaining the B-31 and B-30. Photos of the B-42 and B-35 now reside in the "Loved but Gone" tab which captures engines/accessories I have parted ways with. 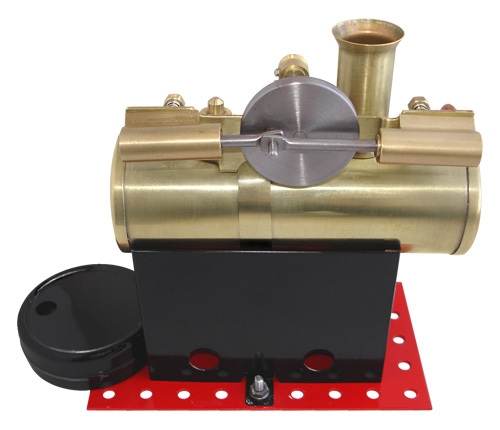 One very appealing feature of the Empire cast iron based engines is the one piece cast brass engine frame/cylinder combination with internal steam lines. Simply put, everything painted RED above the boiler is heavy brass except for the wooden valve knobs and everything painted RED below the boiler is of made of cast iron. Pistons and connecting rods are also heavy brass construction with built in piston oil grooves, something usually found on only the best engines. In addition to their cast iron based engines, Empire did another thing very right. 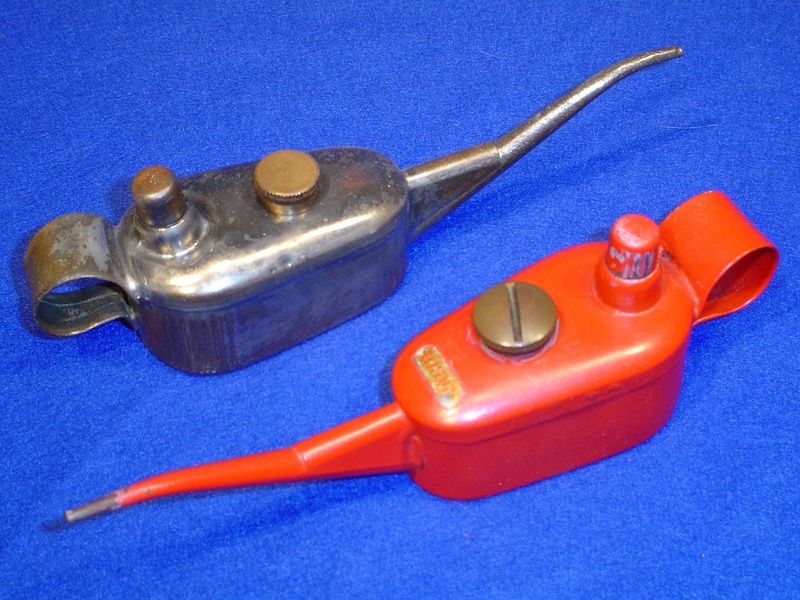 They made a set of pressed steel accessories different and more robust than any others by any maker I have seen. I know some of the Nuremburg makers had pumps, windmills and waterfalls for example, but the gauge of tin used in them seems less than half that in the Empire group. I think the Empire accessories were truly built to be kid-tough, and as a result they have lasted well and by the numbers seen on eBay, they made a lot of them. Using Stilson's book (bible), I have been able to confirm model numbers, approximate years of mfg. and even the official names. As best I can tell there were 7 total accessories made. A few of these had different numbers and slight modifications over the years of production. 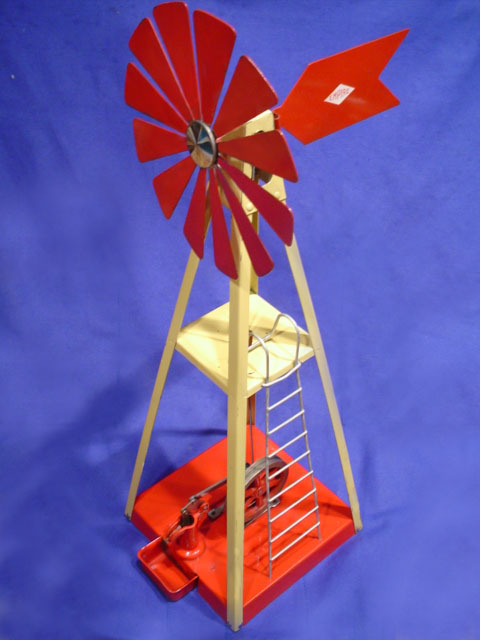 This collection includes two of the original accessories...the B-47 ferris wheel and the #56 windmill-pump in original perfectly good condition. 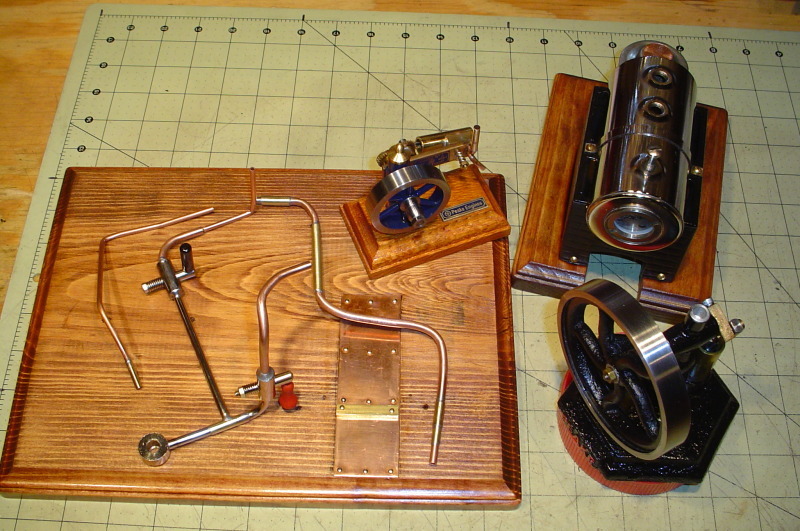 I had a #B-34 variable speed windlass and B-50 water pump, but subsequently sold them off. There are several other unique accessories that were made, but either they were not that popular or maybe didn't hold up that well, but I have NEVER seen them in the flesh or on eBay. They are pictured in Stilson's book, so at least one of each was made!! These rare pieces include the #48 carousel-like rotating swing, #51 buffer and grinder and #52 circular table saw. Although the B-42 is a pretty impressive looking piece and desirable in part because they are hard to get...it is NOT my favorite Empire. That honor goes to the B-31 pictured below. Favorite Empire honors have to go to my B-31 vertical which is really just a B-30 horizontal turned on end. I'll get to the B-30 in a little bit. Pictured to the right, you can tell this is a stout piece just by hefting it your hand. Aside from the stout construction aspect I like of these engines, the best part of the B-31 is the really unique chuffing sound it makes under steam. I think that is caused by the piston and cylinder orientation, but whatever the reason, it is a delight to run and listen to. It is the 2nd most popular cast iron Empire in my opinion, based on frequency of seeing them on eBay today. The B-30 was actually the first Empire I acquired having spotted it on eBay and thinking it was both robust looking and quite charming. I knew nothing about them, but I figured it had to be a substantial piece just by the shipping weight!! Don Stilson's book indicates this model was popular and had a long production run from 1921 to 1941. The popularity and resultant number made explains why this is the most frequently seen cast iron Empire on eBay today...there is usually one or more for sale each week. As received the engine was an eager runner, but likewise an eager leaker. Unlike Jensens where you can get all the gaskets you need with a toll free phone call, Empires don't come with that luxury. It's a trip to the hardware store with engine in hand and a sheepish grin asking "do you have something that will fit this" (then 20 minutes explanation of what "this" is). Ultimately a few gaskets end up being store bought from the toilet washer section and the rest home made from flat gasket stock!! Nearly all old steam engines with sight glasses arrive on their new owners door step as leakers...that is practically a given unless a prior, recent owner did the honors and sometimes even those are less than perfect. I won't go into gasketing further here, but check the tab "Restorer's Toolbox" which I will be populating with trivial little time savers and repair solutions as I get to it. Fixing the sight glass gaskets and getting the stack/pressure valve to be steam tight are both covered in that section. 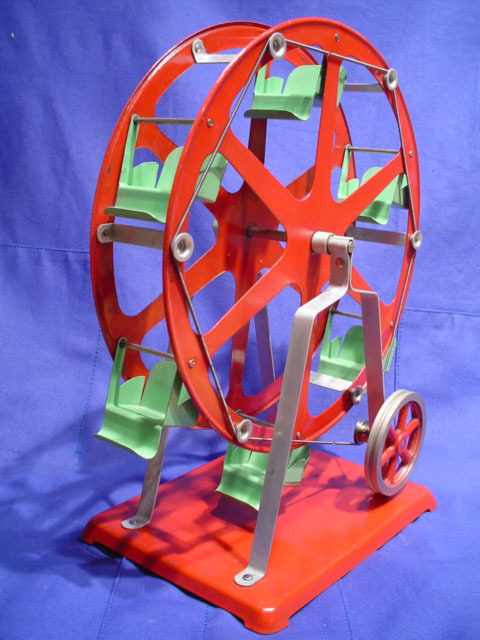 The B-47 Ferris Wheel pictured to the right is 13" tall and was made between 1933 and 1940. It has six swinging seats and powers nicely from most any engine, though for realistic effect the engine needs to be run at low speed...I don't think ferris wheels are meant to spin like a circular saw! These come up from time to time on eBay. Just pay attention to whether piece you are looking at has all it's bits. Seats are occasionally missing as are the flared guides that the spring belt must ride on. Replacements for those could be made, but there seem to be enough pieces out there that you can find a complete one. Some come with a white Empire decal in the center of the red base, mine had no evidence of one ever being there, so maybe it was year dependent? If you find one without the drive belt, not to worry...just hook a couple of Wilesco or Jensen 9" belts together and they work perfectly, that's what I used. Here's a video of my Empire accessories (past and current), all being powered by my B-31. The windmill with built in pump is my favorite Empire Accessory because it does two things at once and does them well. It is also a big piece, 21" in height. The drive wheel getting power from the steam engine directs that power two ways: UP to turn the windmill blades via a very long drive spring and it also directly connects to the water pump. Image is supposed to be a windmill driving a water pump but it's really a steam engine driving both. Pretty sharp how I figured that out, huh? This accessory was a very popular piece and was in production from 1935 til 1953. Mine is the B-56 model, but an earlier iteration was called the B-36...similar but a little different. Notice the little white Empire logo on the tail, same one as on the windlass. 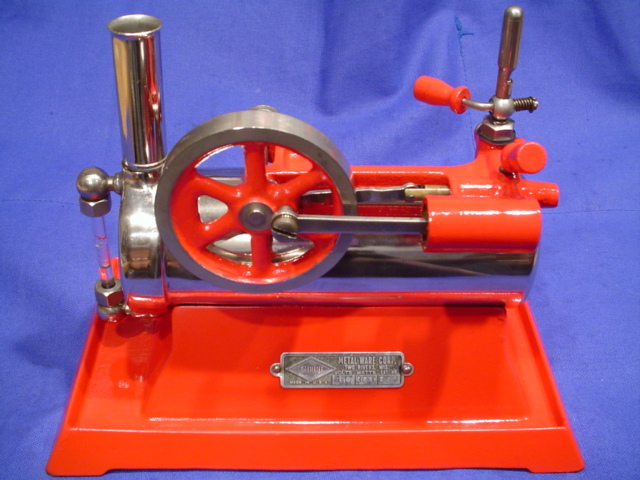 The pump mechanism is identical to the model 50 pump and can be seen in the closeup below. Again, if you are shopping for one of these, watch for rusted metal bases which are also prevalent on the model 50 pump and probably for same reason. Like the Ferris Wheel, you will need a long spring belt to reach the wind vane at the top. I linked two 9" long Jensen belts together and with a bit of stretch they work fine. Mamod began making the the TE1 in 1963. This example is most likely a 1964-65 vintage model bearing the early mark of a brass "nut and bolter" vs. riveted construction which came along in 1965. The detail cast into the rear wheels is simply gorgeous, right down to the 2 raised rivets on each wheel spoke. This TE1 is in fired but pristeen condition after just a bit of spit and polish. The TE1 and subsequent TE1A went on to be among Mamods most successful offerings and 44 years later the TE1A version is still being made. They are NOT large engines, but they pack a lot in a small space! The TE1 had several features I really liked in addition to the quaint nut and bolt construction. These include the ability to throttle down the speed with it's classy brass inline exhaust regulator. I can also toot the whistle with an equally classy brass whistle. A "meths" (alcohol) vaporizing burner provides the heat source...a pleasant change from the smell of Esbit tablets used on later Mamod models. These 4 desirable TE1 features were changed in later years, but this example has them all and it's easy to understand why Mamod collectors have a warm spot for the venerable TE1. An added nicety is the use of copper leaf springs on the front axle as seen above. In the pic below, you can clearly see the brass exhaust regulator that enables the user to really throttle down the speed to a more scale like pace. Regulating speed via exhaust control is a new one for me...most of my engines throttle the steam output BEFORE passing thru the piston...this one does it very effectively on the back end. The whistle can be seen to the right rear directly over the firebox...hence one needs asbestos fingers to operate it when a fire is down below, but again, it looks great, I'll just need to toughen up those fingertips! 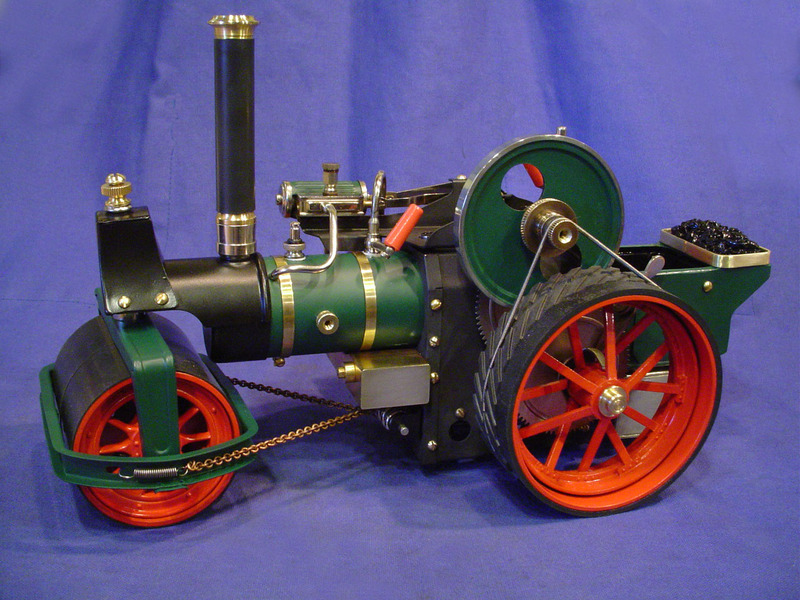 The turned brass whistle and regulator are so appealing...it's easy to forget that this little jewel is NOT a high priced model traction engine...this is a toy, just a very well executed one from the days when the Malins family ran Mamod and quality was king. Although I am not usually a fan of acquiring and then storing original boxes...this piece came along with a pristeen box plus all the accessories, literature, funnel etc. that accompanied it when shipped from Mamod's Thorns Works, England facility in the early 1960's. While of simpler construction and functionality vs. Wilesco mobiles, I do prefer the more robust Mamod build quality. This engine took a 40 year nap in the loft of a nice 82 year old English lady named Margaret who sold it to me via eBay. Thank you Margaret, I should be so computer savvy when I'm your age!! OK...I know oil cans probably don't belong in "All Other Engines"...but I didn't know where else to put them! Though I have had these two cans for several years now and they've graced my steam shelves all this time, I'm only just now getting around to creating a virtual place for them on this website. I came by these two in very different ways. About the time I was searching for one on eBay to accompany my British engines particularly...steam friend Steven of the UK sent me the red one as a gift. Almost at the same time, I won an eBay auction for a stripped of paint example that I like to pose with my Stuart Beam which is also sans paint. The red one sits with 3 of my other Stuarts just because it looks especially good with them! 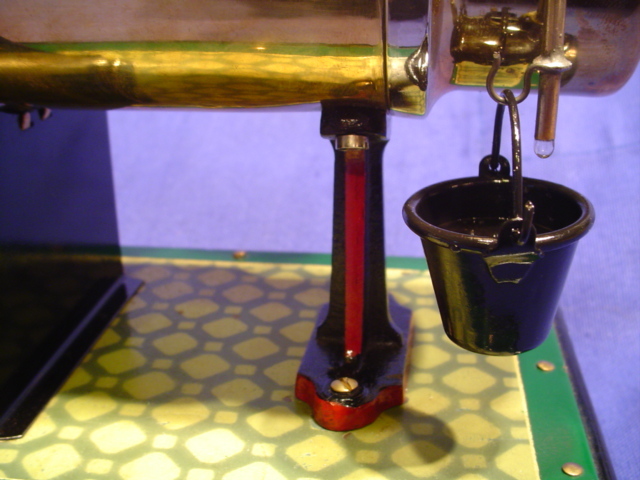 I don't actually oil with them, preferring a needle oiler for control, but I love to simply look at them and envision a much larger version in use on the full sized steam engines that inspire our toys and models. I shall have to post some additional info on the Sutcliffe company and how they came to make oil cans for small steam engines like ours, but I will leave that for another day. 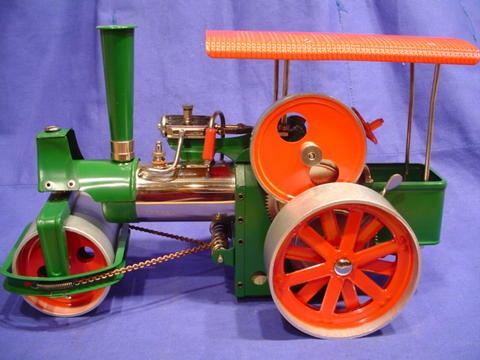 Every collector of toy steam engines has at one time or another owned a Wilesco or wished he had. Mind you, they are NOT one of my favorite manufacturers, but they put out a good product overall and I have two of them in my collection for which I have a warm spot. Wilesco's are of German manufacture. 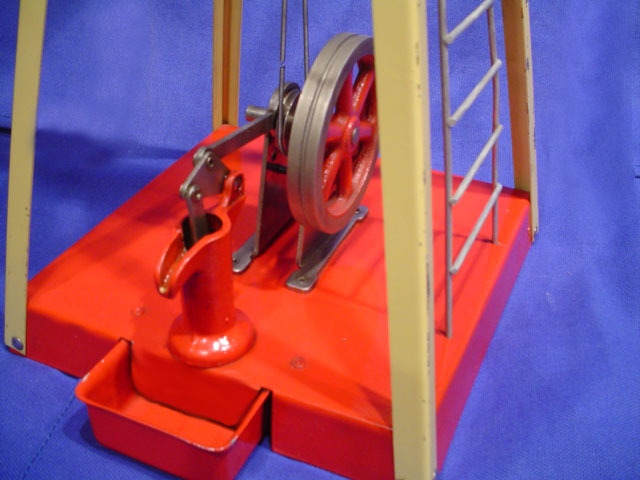 The name is based on the initials of one of the founders, Wilhelm E. Schroeder who with partner Ernst Wortmann, took over the Fleischmann line of toy steam in the 1960's, probably soon after I got my Fleischmann in 1961. Wilesco is the last genetic link to the golden Nuremberg era of steam, so it's nice to see them alive and well to carry on the tradition of German toy steam. Check out the Wilesco website, they offer a huge number of engines and accessories to match suitable for all pocketbooks. It's funny, but Wilesco's use of pretty thin tin and a few bits of plastic is probably the biggest turnoff I have with them, but then they incorporate a nice feature like in-line lubricators on both the following pieces, a really nice touch not seen on a lot of engines in the toy steam lines. This piece will bring the kid out in anyone, maybe because it looks like a toy we might have had as a kid. Mine was about 25 years old when I got it, and unfired til Oct. 2006. It ran well, will go forward and backward just by reversing the flywheel rotation, exhausts steam out the green stack and will run at idle when the left rear wheel gear is disengaged. Despite liking my Old Smoky, in Nov. 2007 I decided to modify it to look more like a D.R. Mercer roller...a much more expensive piece I would truly love to have. I have actually added a Mercer TE since this modding...but still love this thing! While I was shooting for the Mercer look, one steamer commented that it might be closer in appearance to an 8 ton Aveling and Porter steam roller. Whatever, it's a ball to run and I am happy with it! Left below is a pic of my original "stock" Old Smoky. Right below is a pic of an actual D.R. 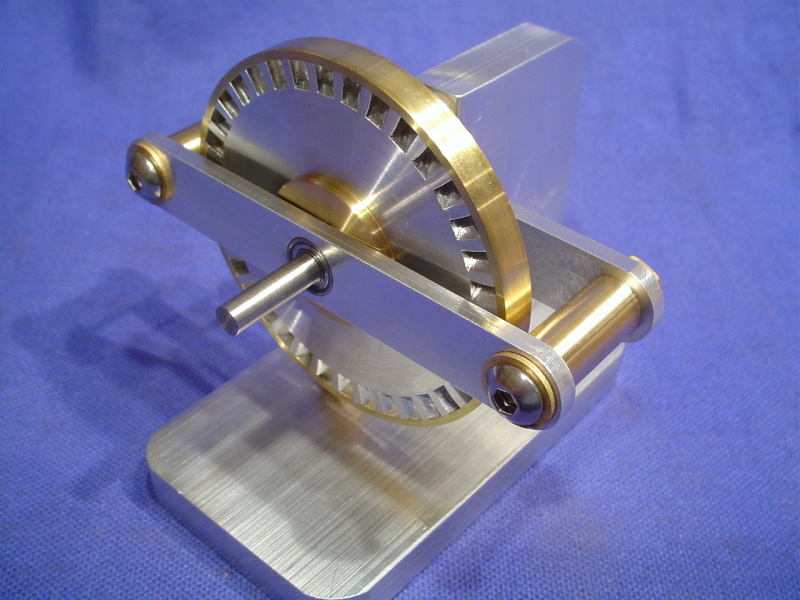 Mercer roller model. Front and center is my finished roller after a number of modifications. A "few" more pics...can you tell I am delighted with how this turned out? To the right is the custom alcohol tank and burner designed to slide in under the coal scuttle...it fits and works beautifully. I made the tank from brass plate bent into a box plus brass tube and a couple of ammo casings for upright burners. Burner slides in and is retained by a couple of pieces of picture hanger hardware soldered to the bottom of the scuttle. Squared off brass knob is the filler plug vent and also helps to keep tank aligned in place. Pic below shows tank in place with screws/filler cap slid into the retaining hangers. I highly recommend that if the spirit moves you, this sort of modified engine is well within the scope of what most folks can do and won't ruin a rare or exceptionally valuable piece. Old Smoky models in good shape can often be found on eBay for about $150 USD...plenty have been made. 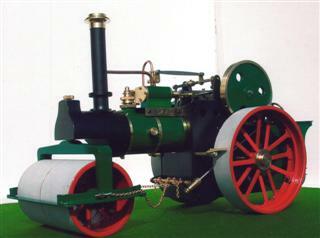 The Wilesco traction engine is almost the same platform and would work as well with adjustments. Results of such modding are the look and function of a much more expensive engine. The fun in getting there?...Priceless! Here are a couple of videos to wrap things up. First video shows the engine running with it's designed in gear system...a nice scale pace with the characteristic gear clatter Old Smoky's are known for. Second video shows the engine running about 2X normal speed using direct belt drive from pulley to left rear wheel while gearing is set to neutral. With this set of mods, one can enjoy either of TWO speeds or stationary running in place. It's not a Mercer by a long shot, but it will tide me over til I can get one!! This piece is about as common as they come, but I still wanted one when I saw it. Neat vertical design is a bit different from other engines and it runs with a pleasant thump, thump sound. Flue gases rise thru the center of the boiler and exit the top of the stack, sort of novel in that the stack actually functions as a stack and even helps heats the boiler in the process. The whistle is a bit different design than any others I have, but it sure chirps well! This one isn't old really, kind of in between the duration of Wilesco making this model. It has darker blue paint on base than more modern examples, but still older examples have gray bases. I'm told they were made like this one from about 1990-2004 ("Made in Germany" imprint on bottom). About 2005 Wilesco really did something stupid in my eyes, they removed the metal from the whistle and steam valves of their engines, and replaced it with a nylon-plastic composite. I had a new, virtually identical D455 (2005) version of this engine, but traded it shortly after buying because I despise such parts in contact with steam. In fact when I received that engine new from Germany, the steam valve's plastic inerds were already snapped off and lying in the bottom of the box! Easily replaced...but why jeopardize such a critical part with something so fragile. I could see a blast of steam in a child's face if one of those broke under pressure...not good. My current example here does NOT have the plastic valve parts which is exactly why I bought it when I realized the difference...instead these key parts are nickeled plated brass, proven over a hundred years to work well, not break and look good. I have fired this engine countless times using a Forest Classics aftermarket vaporizing alcohol burner set into the Esbit tray...it works well but burns only about 6 minutes due to it's small size. This model has been around for a long time, testament to it's popularity and solidness of the design. I love it! The following video is of my former D455 running at breakneck speed using a denatured alcohol (meths) burner borrowed from a Bowman M135...this might be 2X normal rpms...it was going so fast I had to temporarily screw it down to a piece of plywood or it would dance off the table top...never did that on Esbit tablets alone. The mythbusters would say "don't do this at home, we are professionals"...I say, do whatever floats your boat...just use some common sense (I had on safety glasses and a fire extinguisher about 2 feet away). 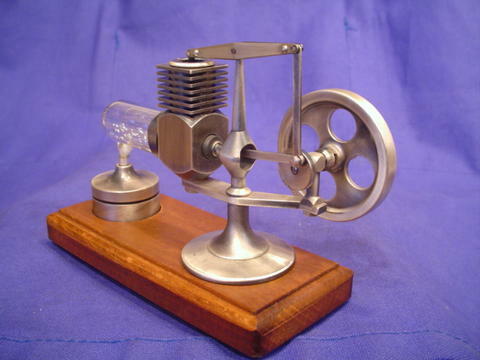 These Stirling engines are modern offerings readily available from eBay or other online sources. While not historically collectible these engines demonstrate principals discovered over 100 years ago. They operate by heating a fixed volume of air that increases in pressure as it get warmer. The warmed air acts on the underside of the piston pushing it to the top of its stroke, the air is then cooled. 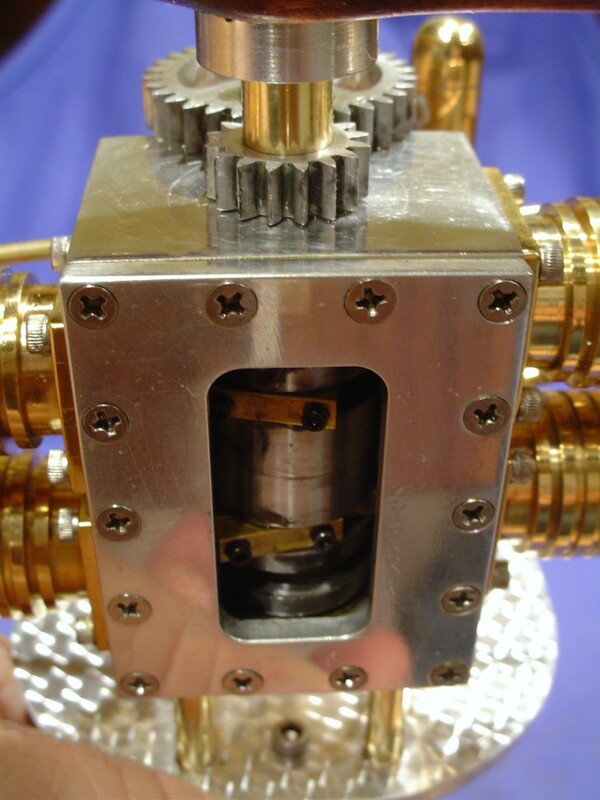 The cooled air has reduced pressure and allows atmospheric pressure to push the piston back down. Stirlings have two pistons, the power piston which drives the crankshaft and the displacer piston which moves the gas between hot and cold parts of the engine. This process is repeated rapidly over and over resulting in the motion you see. Not sure the "Flame Eater" belongs under a "Stirling Engine" tab, but for lack of a better spot, this is where I'm parking it. Also called a "Flame Licker" or "Flame Gulper" by some...it is technically in a class of engines known as "Vacuum Engines". This is my second time owning a PM Research version. This one is an earlier model purchased as "New/Old Stock" and in my opinion it runs better than the later model I no longer have. The nickeled flywheel a very heavy as is the brass cylinder. The piston is large and rivals that on my Jensen 51 replica at 1 inch diameter. Stroke is 1.75 inches ...chunky bugger indeed! As received, it comes with a blackened solid aluminum base. I have attached the black base to a nice piece of finished wood for appearances sake...I like wood bases! The whole setup is hefty, weighing in at 5 1/2 pounds. Unlike a steam engine, NO oil is used in the cylinder for lubrication as it would simply burn on the sidewalls without water to cool it. Instead, lubrication is provided by powdered graphite applied every 2-3 runs with a Qtip on the insides of the cylinder walls. Simple enough and it runs very smoothly once the flame is directed to the "sweet spot" on the cylinder, just behind the port visible below. Finding this perfect spot for the flame takes a little trial and error, but it is worth it...bit like having a Hit & Miss engine running on your bench top when you get it running right! To keep the nickeled steel burner oriented to the right spot, I have added some self stick magnet pieces under it. Although I have watched this engine operate dozens of times, the principal just seems to evade my understanding. You heat this glass tube with another glass tube inside, and in about 5 seconds the inner tube begins to move, which sets the whole thing in motion. Many inventive folks have tried to harnass such motion on a larger scale, but nothing commercially successful seems to have ever come forth. 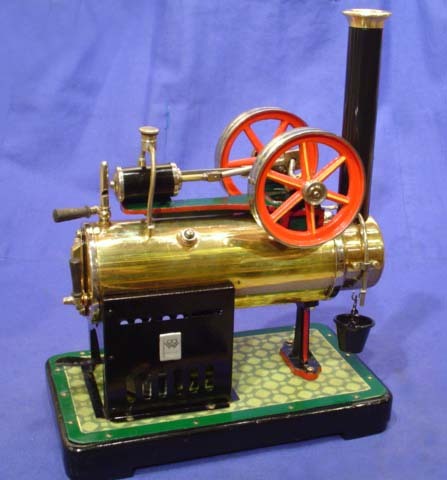 It's primarily a novelty, but a pleasant one for those of us who collect toy/model steam engines and occasionally like something a bit different. The HOG will operate a good 12 minutes on a filling of alcohol and operates almost silently in a blur of moving parts. This engine is also a favorite with visitors who will hold it in a hand and marvel that all that motion is driven by a tiny flame. 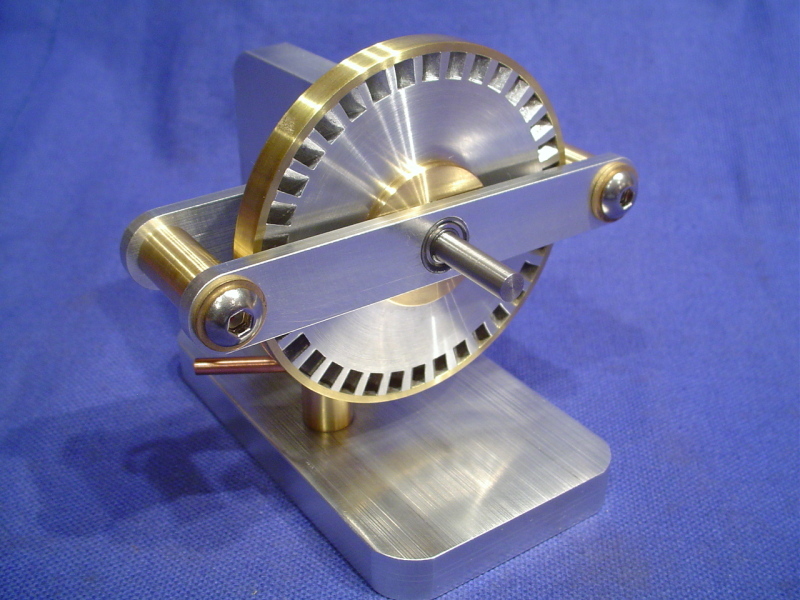 Here is video of my two Stirling engines humming along together (ignore the Boehm, I've sold it since). I just seem to have a soft spot for delicate, almost jewel-like engines! 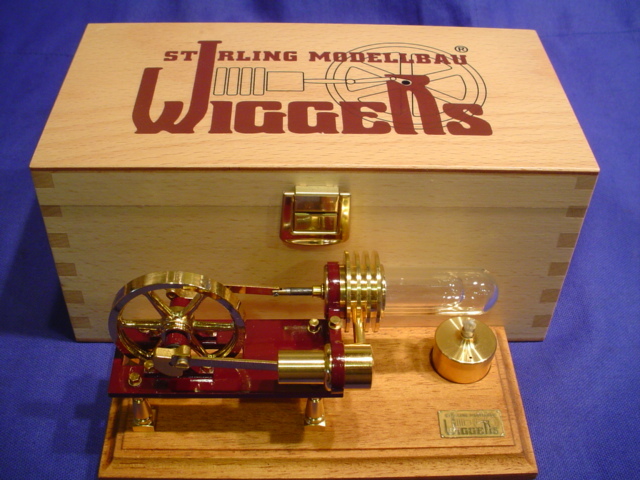 This modern Stirling engine is built by Wiggers Stirling Modellbau of Germany and represents their simplest version of a wide variety of very nice Stirling pieces. Despite being an entry level piece in the Wiggers line, it is very nicely finished, and like my HOG engine, it runs beautifully on a spit of denatured alcohol. 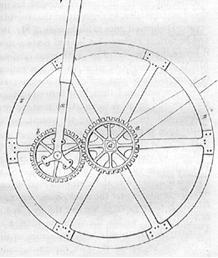 Wiggers use a glass heating cylinder and displacer identical to that on the HOG engine...maybe they source that part from HOG (or vice versa). 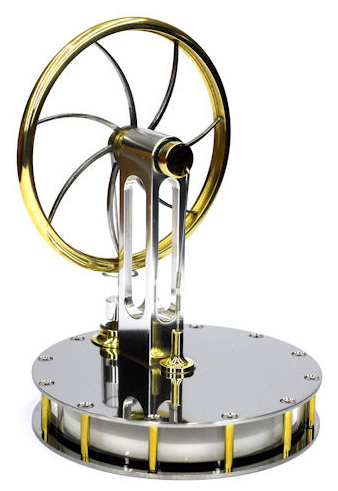 The flywheel is touted as being of gilded cast iron vs. CNC machined and the bright bits are also gilded. The wood base is Abachi-wood which I believe comes from Brazil. Wiggers packages this engine in a lovely custom fit outer beechwood box that could be considered a jewelry box given the beautifully dovetailed corners, fancy clasp and hinges. BUT, we don't buy the box, it's what's inside that counts. I just love the looks of this engine running or sitting still (even in the box). 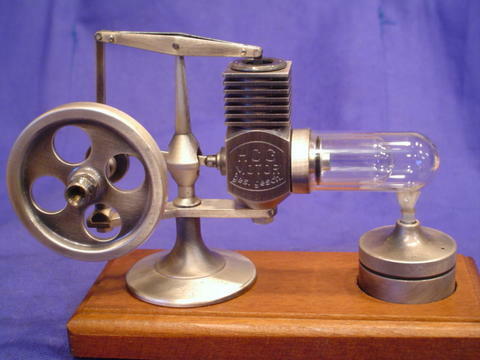 I've admired this type of Stirling engine for ages and finally broke down and bought a German made CarlAero Stirling in kit form. Kit came in record time, assembly was not so easy. I broke one part in the assembly process and CarlAero were very helpful, shipping me another part at no cost. I do recommend their finished product, quality is first class in every way. Let me caution anyone interested in buying this engine in kit form...don't...buy it assembled for just $40 more shipped! Those 12 little Philips head screws seen on top and 12 more on the bottom were a bear to thread into the 12 unthreaded brass tubing supports. The rest of the assembly process was pretty straightforward, but getting all those screws in place took me almost 4 hours. BUY IT FINISHED! Despite my struggling with the assembly, the completed engine is a thing of beauty, performs flawlessly and is whisper quite when running. Sit it on top of a cup of boiling water and it soon takes off...powered by just the difference in heat between the bottom and top stainless steel panels. If you keep the cup of water sitting on a mug warmer, this little jewel will run all day with no tending whatsoever! 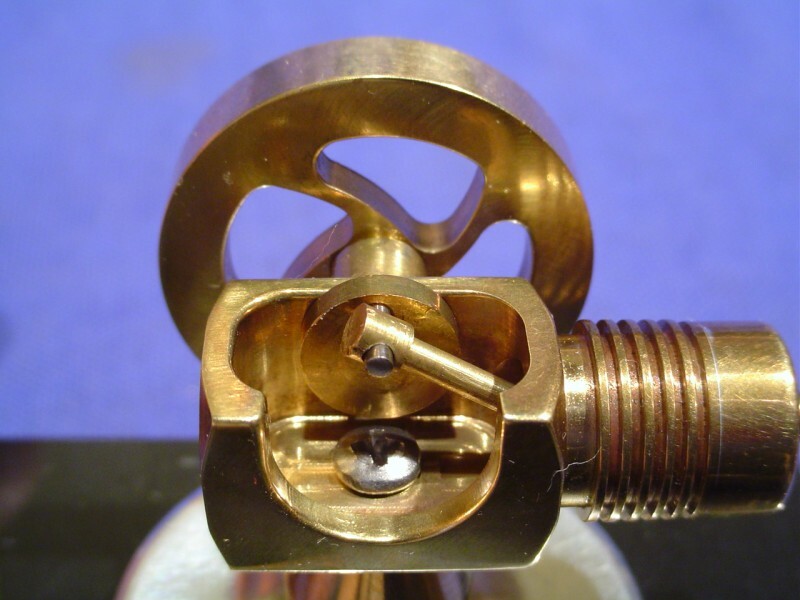 This type of Stirling engine is truly magical to watch operate. Get one, it's good for the soul ! I've wanted a D.R. Mercer TE or roller for many years now but was always put off by the high cost when purchased new, AND the long wait to get one. Each is handbuilt by Mr. David Mercer in Birmingham, England at the rate of just 2 per month. 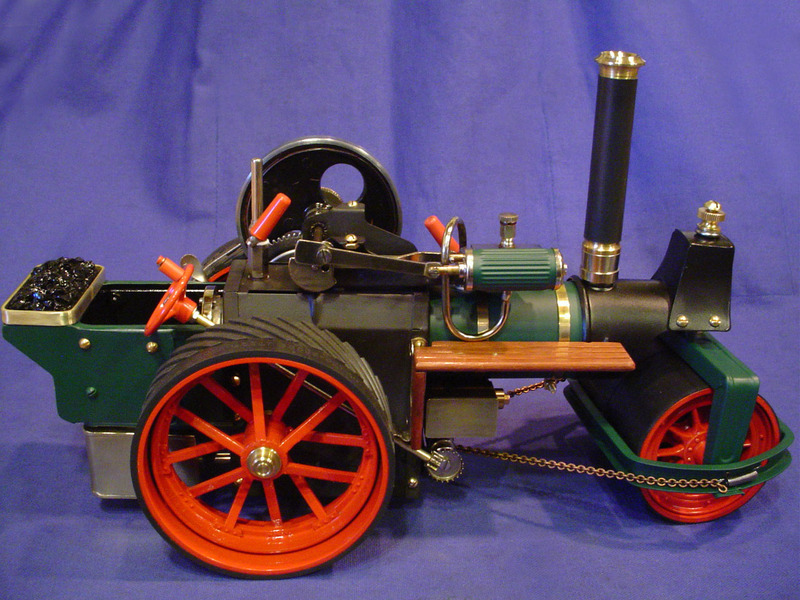 Mr. Mercer has loosely based his design on the large traction engines made by Burrell and Garrett in the early 20th century, with all build materials machined or made on site. In June 2011 I got my chance and purchased this older yet unfired/shelf queen Mercer from Alistoyshed, an online reseller in the U.K. Owner Alex was a delight to deal with and shipped the engine well packed for it's 4,000 mile journey. Highly recommended source I will purchase from again! 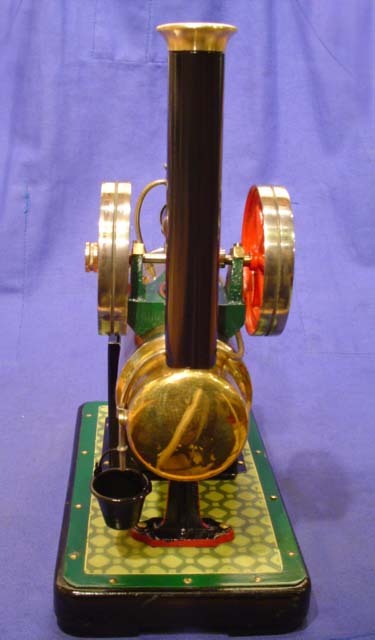 The double acting slide valve engine with full Stephenson's linkage has a working throttle lever, Forward, Neutral and Reverse lever that changes direction of travel and a lever to engage or disengage the drive wheel so it can sit still and run in place. The steering mechanism employs a worm gear and chains like the real thing and the smokebox door on the front will open and latches like the real thing. Steam exhausts thru the chimney. In addition to the basics offered in the Type 1 variety, this one had a few Mercer accessory upgrades including the personalized roof, a six spoke brass flywheel and the protective gear cover (green just above the right rear wheel visible above). The engine is solid and paint is in good shape...nothing needs restoring. Compared to the more toy like traction engines available, the Mercer incorporates more things akin to a real TE, only nicely miniaturized. Mr. Mercer must like brass as he uses it extensively in making these engines...check out those brass treaded wheels front and back! I will be using rubber treads to protect those wheels on concrete. In the photo below you can see the lift up door on bottom rear of the scuttle, which allows the burner to be inserted. The knurled brass knob just visible in the center of the scuttle's top edge is an on board oil reservoir with a dipstick for applying a small drop of oil to moving parts. Notice the built in steps to both sides of the scuttle and the integrated tow bar in the lower rear of the scuttle. An inline displacement lubricator and built in oiler cup on the main crank are yet more niceties. It's easy to understand why folks wait in line many months to become a Mercer owner. I was lucky, buying from Alex of Alistoyshed, I got to jump the line and had this beauty in 7 days from buy to delivery. As purchased by me, the engine was missing it's factory made alcohol (meths) burner which slips under the scuttle's rear and is concealed within...original was lost somewhere in time...perhaps lack of a burner was the reason this engine has never had a fire under her! Since I acquired this engine, Mamod forum friends provided photos and measurements of the steel meths burner, which I have recreated to the exact same dimensions in brass. Here is the burner sitting just behind the engine where it is inserted. Partially inserted in the rear under the scuttle. Fully inserted with only the vent tube protruding from the rear as designed. Burner works flawlessly (outside the engine), but I have still not fired it within the engine and engine remains pristine and unfired, I have run it only on air. I instantly knew I was going to like this outfit's stuff because both slogans describe me perfectly. LiNEy was a small family based machine shop in Spokane, Washington, founded by owner Lance Erickson, He has created a number of unique designs which are available as plans and sets of metal components for the home machinist to build them himself. Lance describes his pieces as capable of being put to "work" and designed to run very well, but they are intended primarily as works of art. When coming up with a new design, Lance would often make a few pieces and sell them as finished engines, but these are available in limited quantity as each one was hand built and every part precision machined from solid stock. While plans and components to build them were his primary business model, Lance would build-to-order, allowing for some customization. 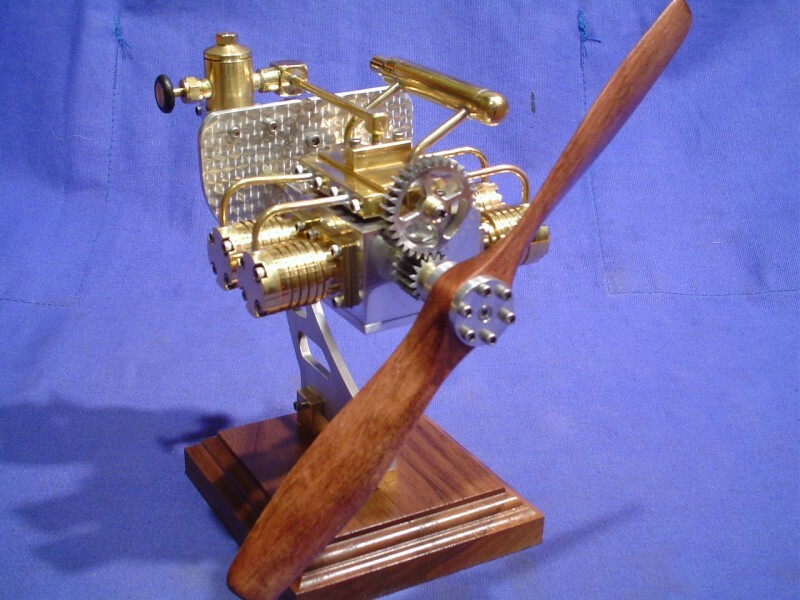 My LiNEy Four Cylinder Aircraft Engine is a good example of such customization, he incorporated a steam oiler into the design at my request. The original Thimble engine in this collection was from a run of about 25 he made for sale and was my first example of LiNEy quality work. The Four Cylinder Aircraft engine is potentially his last hand built of that specific model. Lance no longer owns the "LiNEy business, he sold it to www.ministeam.com years ago, then followed a dream and now flies medical relief flights in Bolivia!!! Doug Pusser of Ministeam maintains LiNEy plans and casting sets, but I don't believe you can get a fully machined LiNEy engine since 2009/2010 when the changeover occured. In Dec. 2006, with a bit of Christmas gift money burning a hole in my pocket, I went browsing on eBay for something to relieve that situation!! I was immediately attracted to a new engine offering for a machinist built engine by a company called LiNEy Machine. While it's officially called the "LiNEy Thimble"...I have come to call it my "Tiny LiNEy". Though small indeed, it is an enjoyable piece, begs to be run and always amuses ...definitely not a shelf sitter! As pictured above, I have it mounted on a nice piece of marble for stability, but LiNEy also sell a nice walnut base like on my other LiNey. This engine simply screams when powered up and brings the kid out in me every time I hook it to air or preferably steam. I don't know how fast it turns, but several thousand rpms would seem a minimum. Without the heft of the base I added, it would surely dance right off the table top, so don't get one without this or another base to keep it in one spot. Like all LiNEy engines, this piece is precision machined from solid brass stock (except for the machined aluminum pedestal). 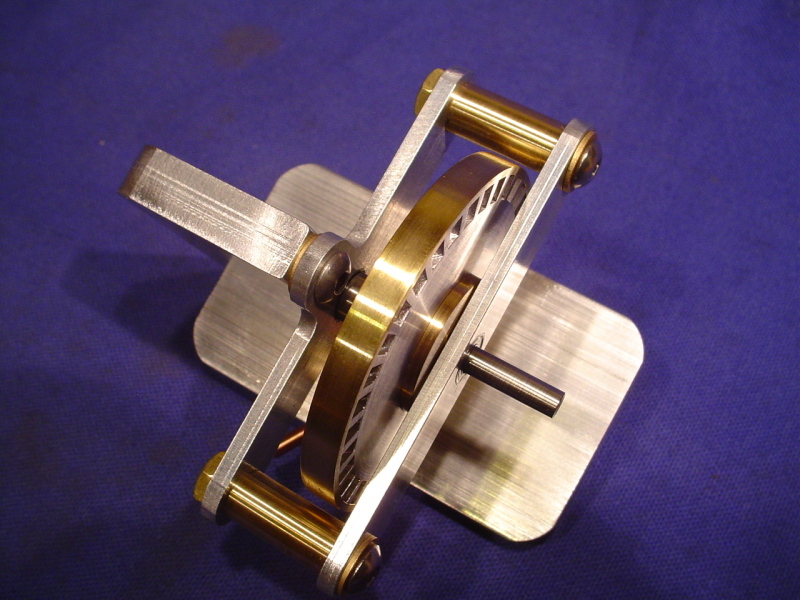 The diminutive flywheel is just 1-1/8" in diameter and the piston a mere 0.3" in diameter. There are no valves involved. Instead, it utilizes a "blow by" style piston machined such that it tips sideways on each return stroke, allowing the steam to blow by the piston. 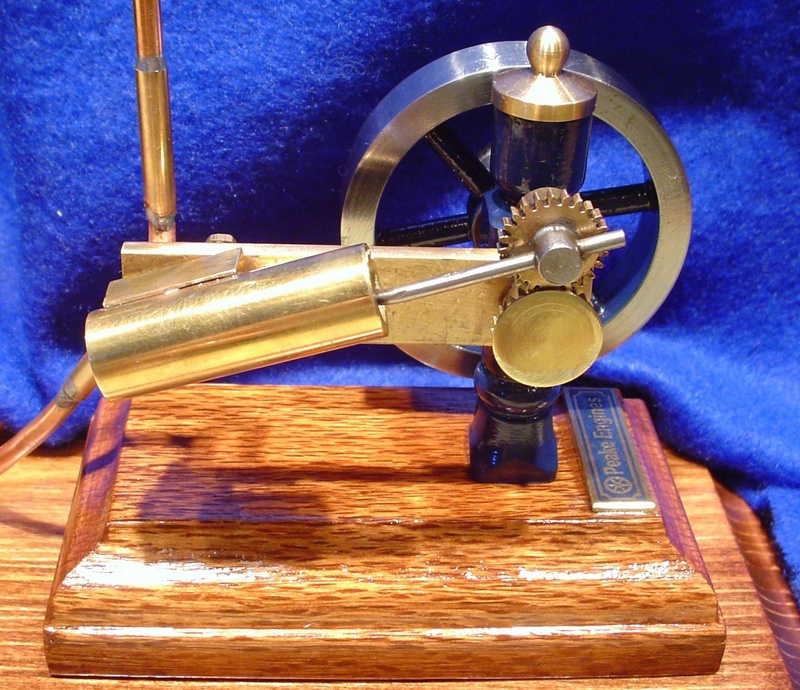 Thimble based engines all operate on this "blow by" principle. It is amazing in it's simplicity and efficiency of design. One more pic just because it's so darn cute! I have seen this LiNEy design for a couple of years now and was longing to buy one when funds permitted. Well, fortunately the time came in Sept. '08 and I added this LiNEy engine to my collection. Machinist Lance Erickson urged me to hang on to this one as it was likely the last of this model he would be hand building. Not to worry Lance, I love this thing!! This engine is a four cylinder opposed type with gear driven valves and timing. The design of this engine is similar to the internal combustion engines that power many small general aviation aircraft as well as VW's. The pistons are 3/8" with a 1/2" stroke driving a one piece crankshaft riding in miniature ball bearings. 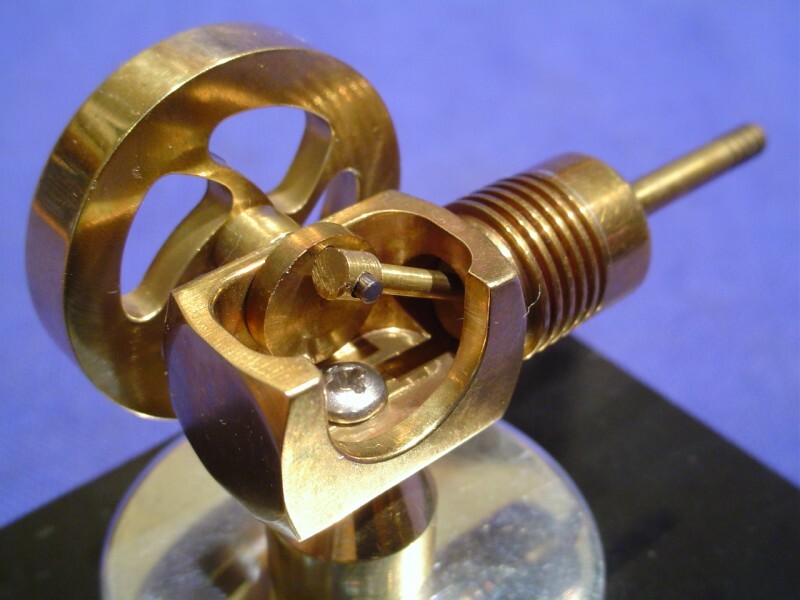 The "RV" designation in the name stands for "Rotating Valve"...a unique valve design incorporating a pinion gear on the crankshaft which times the one piece rotating valve. Lance jeweled the back plate simply for looks, and at my request added a custom in-line oiler for use with steam. It runs equally well on compressed air and live steam. Another close up showing the beautiful machining work on the back plate, oiler and the included muffler set up. Lots of polished brass and aluminum highlights. I did add a small touch myself. The prop as received was blond/natural hardwood, probably ash. I removed it, stripped, stained and polyurethaned it to a color I prefer, just can't leave well enough alone! "This is a special project I've been working on and was rightly named "The Noise Maker, version NM2.51". A brand new item from Wolfgang Engineering. This is a Steam Turbine Engine capable of reaching speeds of 25,000 rpm's with as little as 35 psi. It will run on 5 psi if you wish. It is most commonly run off of compressed air, but can be run off steam if so desired. It is mostly constructed from 6061-6 Aluminum and Brass and is brought to a high polish finish. The outside of the brass ring measures 2.5", the base is approximately 3.5" long by 2" wide. The turbine was designed and built with simplicity in mind and as a conversational piece. There are a number of pieces to this steam turbine that need to work perfectly in order for it to run well. I do machine some of the parts with CNC machines, such as the turbine blade itself, but most of it is hand built with manual machines. Each turbine is hand assembled and tested by me. The entire unit is made in house, right here in the <?xml:namespace prefix = st1 />U.S.A." turbine that sounds like a jet taking off on my benchtop. I kept wondering how high that whine would go, but my small air compresser could only deliver 20 PSI max and not for very long given the high volume this piece takes to sustain operation. So I decided to give this one the acid test, I hooked it up to a table top dedicated boiler capable of sustained 30 PSI steam output. Oh my, that brought a smile to my face and I could not resist laughing out loud as it absolutely screamed. PLEASE...check out the YouTube video that follows just below to enjoy the sound of this baby spooling up. I am absolutely delighted with the aptly named "Noise Maker" turbine and will be watching Wolfgang Engineering for future offerings...this was a winner for sure. A modern brand you may or may not have ever heard of comes to us from England. 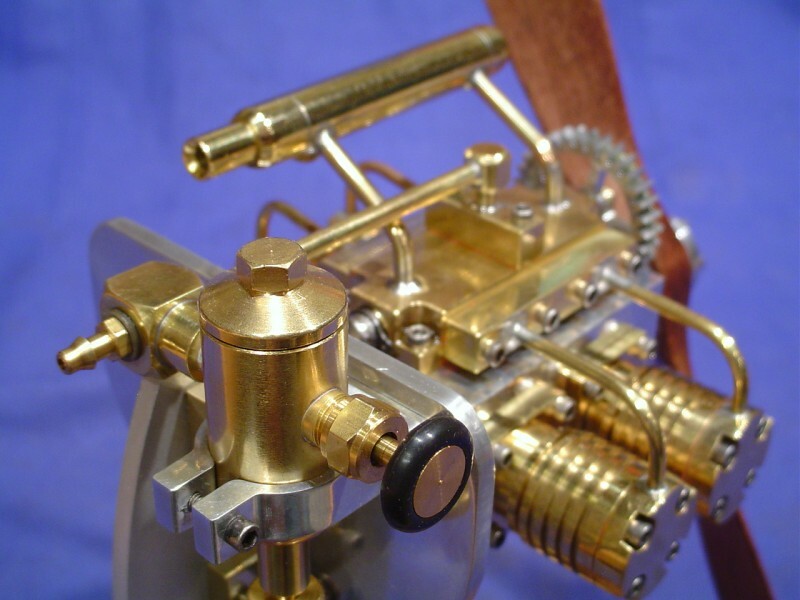 First made in 2007, an "MF Twin" is a replica of a rare twin cylinder engine called the Mamod Minor 2. The original dates to 1939 and total production was no more than 100 pieces at that time. Very few of the originals survive to this day. A gent named Ian, who goes by the online name of "MamodFan" opted to get into ltd. mfg. 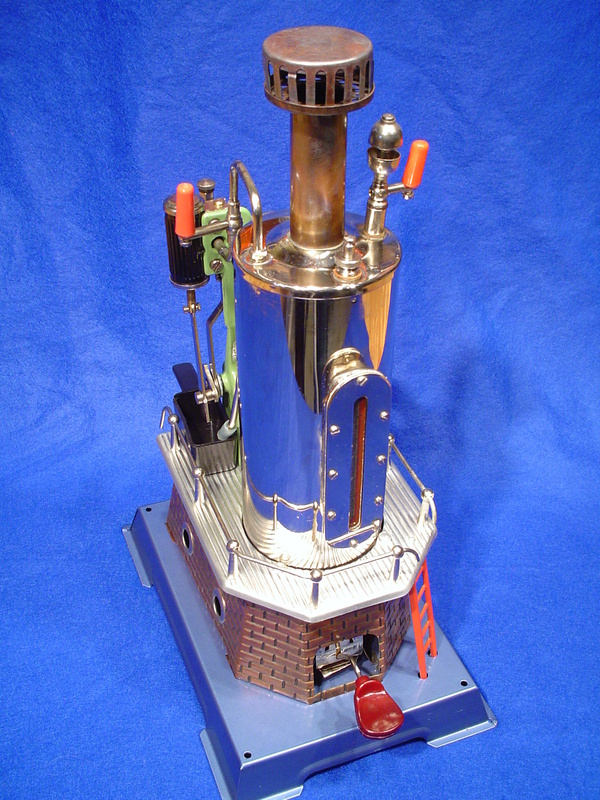 of a replica of the original Mamod twin. Ian launched his replica in 2007 with a goal of 100 total units. Ian sells direct via his website MF Steam , which also features Mamod and Bowman burners , chimneys and other spares he makes. The following photo is courtesy of Ian's online postings and shows a genuine 1939 vintage Mamod Minor 2. You can see the superb recreation he has rendered in the subsequent photos. Each MF twin bears a unique serial number in the series of 100 units. Aside from identifying your specific engine in the build sequence, the name/serial number also prevents someone from trying to pass these off as pristeen examples of the originals. Personally, I doubt any of the originals were as well made as these. 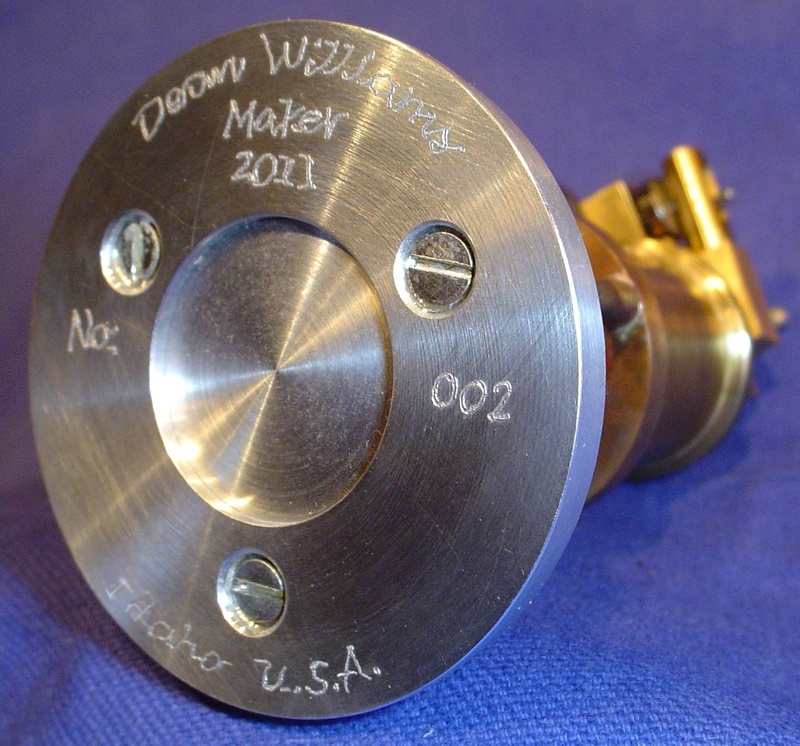 I was fortunate in April 2011 to pick up serial MF Twin #51, an unfired example from another steam collector. I should have bought one earlier, they are fantastic engines...I didn't realize it at first, but given my birth year is 1951, it's kind of neat that I got SN #51. 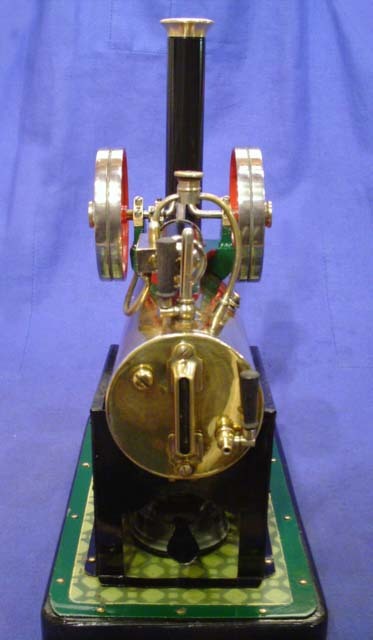 MF Steam are proud to offer for sale the "MF Twin" replica horizontal stationary steam engine that has been inspired by a range of toy steam engines made in England both before and after the Second World War. The MF Twin evokes memories of one of the rarest and most sought after models. Production run of only 100. Overall height of 4 1/2"
MF Steam product. This engraving will also prevent it from being passed off as an original pre-WW2 product. I am partial to wooden plinths for appearance and to keep engines from dancing all over when running. I set mine up a bit on brass spacers for ventilation and quite like the look. The firebox is much more robust than any Mamod I have ever seen and the black/red paint finishes are especially heat resistant...I wish I knew what paint Ian used, as my paint restorations never stand up so perfectly as what you see here. I added one small feature in addition to the wood plinth, a magnet glued to the wood plinth such that it holds the steel burner tank in a fixed position, preventing any movement due to vibration. When empty, you can even turn the whole engine upside down and the burner won't budge...a simple, cheap "fix" that is very useful. I also added a brass vent tube to the cork stopper in the burner tank...experience has taught me that burners produce a cleaner/bluer flame if the tank can vent properly. Many users leave the 1/4" hole in the burner tank wide open to the air, but I am leary of alcohol fumes that close to a flame. Should you fire an MF twin??? I'd like to comment on the "disclaimer" noted on MFsteam's website...it states that the engine is only intended for running on compressed air and/or for static display, NOT for flame firing. Being a small business, I imagine MFsteam felt obligated to make such a statement to protect themselves from the liability of injury, a sad reality in today's lawsuit happy society. I think most steamers know they take some risk every time they fire a steam engine (or plug in an electrically heated one), especially those of dubious past and/or in poor condition upon receipt. One look at Ian's workmanship and at least this steamer had no qualms about firing it...I did so 5 times in one day! I know many other buyers have done the same with their MF twins and like me, been rewarded with a delightful experience. DON'T let the "do not fire" disclaimer deter you from buying or fully enjoying such an engine if you acquire one...they are better made than 90% of the stuff available new from the major makers! A young man from Australia is making a name for himself by producing a line of unique steam engines. 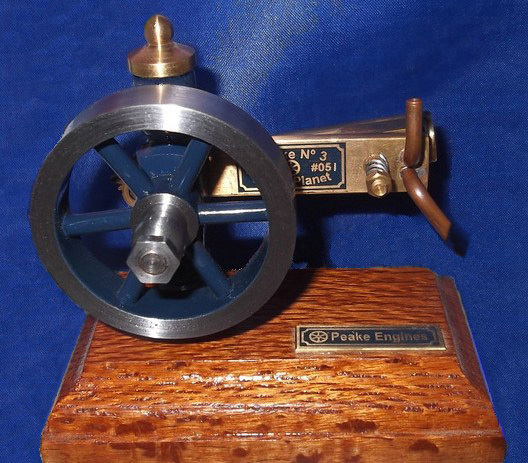 His name is Ben Peake, a trumpetmaker by trade, but with a keen eye to making engines as well. Ben's website is a joy to navigate, check it out! Ben has named the engine above his "Peake No. 2", it is a "2" in the sense that it's his second cast engine offering. The main body of his engine is cast aluminum with brass inserts for the crank shaft, a built in crankshaft oiler and a brass cap to top it off. The Peake No. 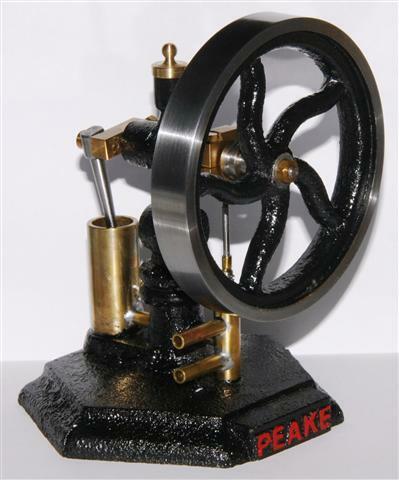 2 is a single acting "upside down" steam engine and the first of the Peake Engines to have a cast 'S' spoked flywheel. My specific example is number 12 of 25...a very small run of a very desirable engine. The "as received" photo of the Peake 2 seen above is courtesy of steamer friend Geoff Walton...he was kind enough to let me use it as I forgot to take a photo of my engine before incorporating it into the plant visible further down this page. Below is the back side of the engine showing the piston, cylinder and crank. The integrated oiler supplies lubrication to the crankshaft and there is an integrated pulley for driving accessories if desired. The engine is reversible and the valve timing is adjustable. 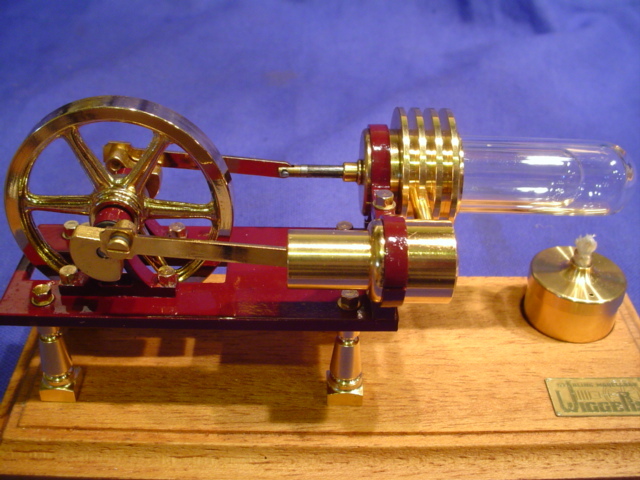 My second Peake engine is an oscillator with a Boulton & Watt design called the "Sun and Planet Gear", first patented in 1791 as a way to convert motion of the piston into rotary motion. The Sun and Planet Gear is neat to watch in action and has the unique property of rotating the flywheel twice for every cycle despite the gears having the same number of teeth. 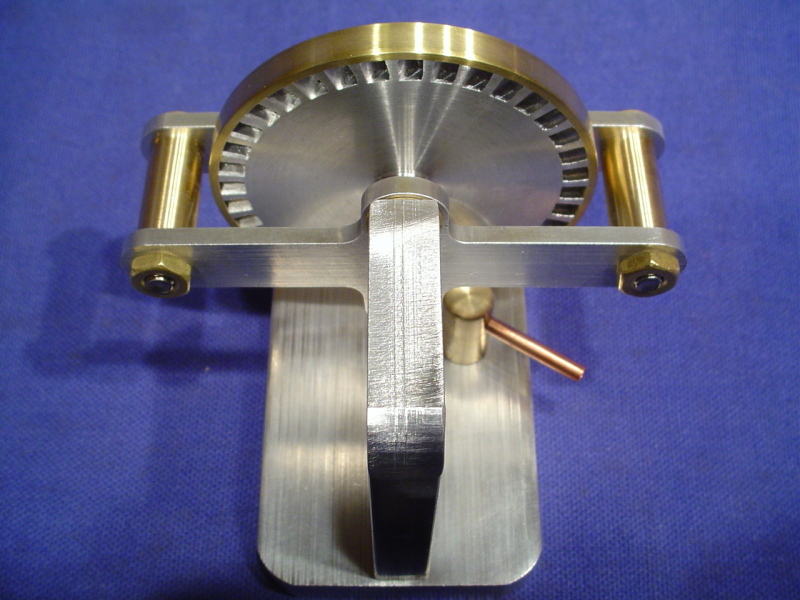 This property enables a lighter flywheel compared to a standard engine configuration. Below is the back side of the engine showing the oscillator with the Peake rendition of Sun and Planet gearing. Ben has added some nice cosmetic features to this offering. An integrated crankshaft oiler is included, a convex flat belt pulley, a lovely Royal Blue paint job and it's all presented proudly on a piece of rare Australian Silver Oak. That bit of wood is really quite beautiful. Just for fun and functionality, I have married both my Peake 2 and 3 engines with a Jensen 60 boiler/firebox to provide the steam and mounted the works on a wood plinth. 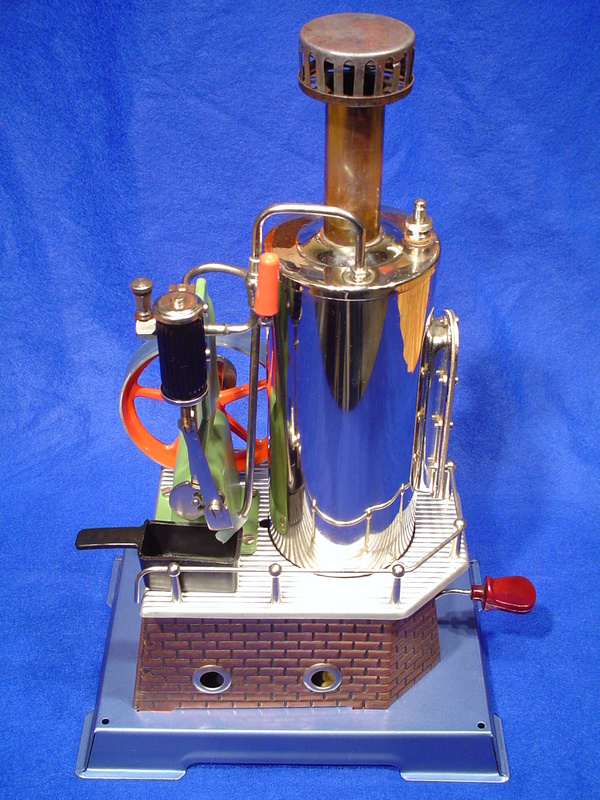 I made up a vaporizing alcohol burner earlier to fire the boiler as shown in the photos below, but now prefer to run it using a gas burner as seen in the video at the end of this section. Each engine can be run separately or both run together given dedicated steam regulators. I prefer to watch the action of the reverse side of each engine, while still being able to see the flywheel. My "backwards" mounting of both engines vs. the traditional "front" was purposeful to best enjoy the view. Given the positioning of the inlet/outlet tubes on the engines, this layout also fit better with my wanting to position the engines to the left and boiler to the right. Condensate is piped out the rear of the wood base under the firebox. The Jensen 60 boiler/firebox combination is nicely proportioned and works exceptionally well keeping up with steam demand. 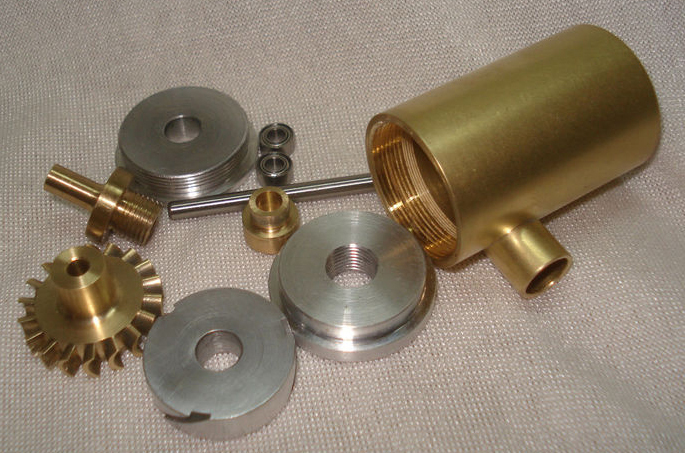 Although sourced from different makers, the Peake and Jensen components look made for each other. I enjoy running this for 20 minutes or more on a firing. The Peake engines run almost silently and it is very enjoyable to watch them do their thing under steam. I can best describe this plant as a "pretty little thing"! It works great and I love it. Ah, 'tis a pleasure to add this engine to my website. Why? Because it was machined by steam friend Dean Williams and given to me as a gift by another steam friend, Philip J. For a collector, admirer of machined engines and lover of "steam jewelry"...it just doesn't get any better! What adds to the enjoyment is the fact I had an engine almost identical to this until a couple of years ago when I had to sell off a number of engines to help meet college tuition payments for my daughter. Then out of the blue, this little jewel arrives in the mail 2 weeks before Christmas 2011, with an Idaho, USA postmark. 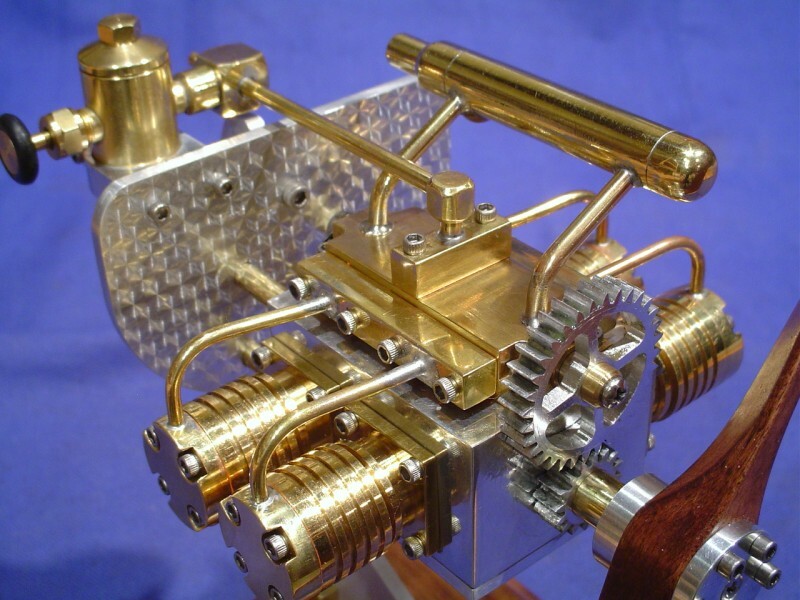 Dean created a wonderful build tutorial for this engine on his Website. Now I have the fruits of his labor in my hands and I never saw it coming. Dean basically made a larger version of Dr. James Senft's "Thimble Power Plant" concept. He had no plans per se, just a few photos of some other examples of this concept and some rough measurements sent by another steamer who owned one. I show the bottom for posterity, because it was quickly hidden by me when attaching the engine to a small base of walnut, cut/routered and finished specifically for this engine. As memory serves, these engines get quite hot when operating and a wood base avoids burned fingertips. Engine is called a "Tripod" for good reason...it rests on 3 legs! Nestled amongst the legs is the burner, a small aluminum tank holding 3-4 cc's of denatured alcohol (meths). I added a piece of graphite wool for the wick given it works well in these applications. Above the burner sits the brass boiler which holds 6-7 cc's of distilled water. A dab of oil in all the right places and a match starts the action...steam is up in less than 2 minutes and it runs for 5-6 minutes. Thanks again Philip and Dean...this engine has a permanent home now in the Temple of Steam. Another creation from the shop of Wolfgang Engineering. The TF-10 as the maker named it has the appearance of a turbo-fan engine off a jet airplane...very cool to look at and even cooler to spin it up to speed. 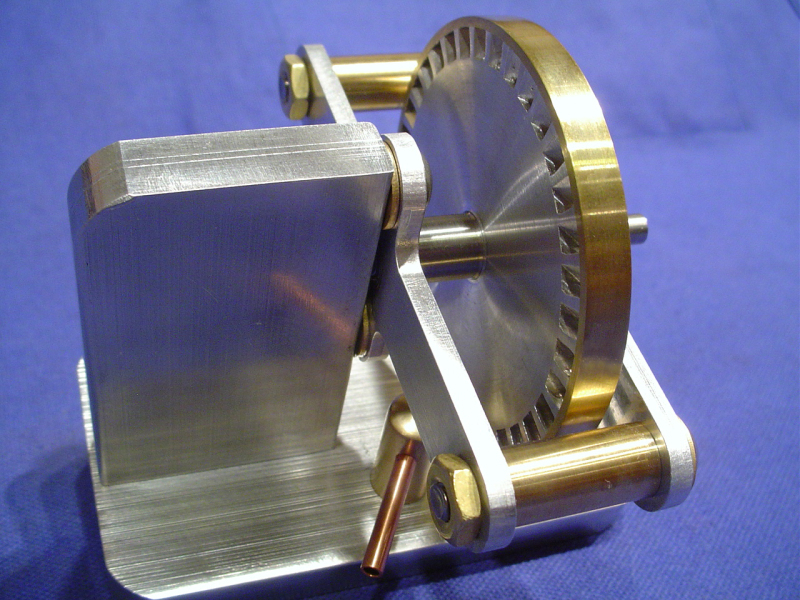 I placed a 1.5", 18 blade turbine fan in the front, machined from solid Brass. The fan cover and cone are machined from solid 6061-6T polished Aluminum which gives it a nice contrast. This is NOT a static model. The fan blade actually rotates when air pressure is entered through the back. It turns the same 0.860 micro turbine blade the AM-10 has and brings the turbo-fan to approximately 35,000 rpm with about 45 psi. 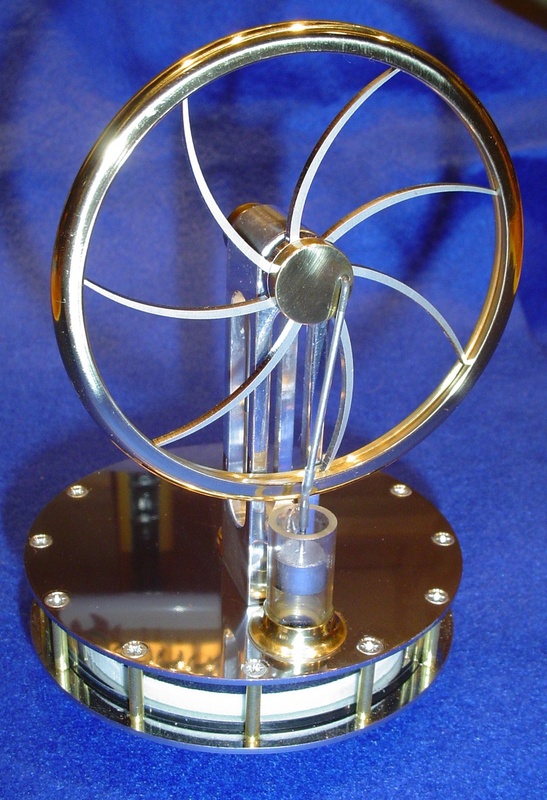 The total height of the model stands 3.5" tall and is placed on a 2" by 3.5" solid Aluminum base. You can also see all of the small detailed parts that go into the project. There are many pieces that have to go together just right in order for everything to work out properly, and each model is hand assembled to make sure everything works. I will not be building too many of these. They are very difficult and time consuming to put together especially, when working with such small pieces, some only 1/8" across". More pictures just because I'm very taken with this engine...what a cool addition to the Temple! My present air supply is very limited and doesn't do this engine justice. I will add a video with sound as soon as I can find a friend with a high PSI air compressor. OK...it's not an engine, but it's machinist built, needs a home and this seems the best spot! This work of functional art was a gift from a mate who lives in Australia (aka Oz, Downunder). Geoff goes by the affectionate term "Oz Steam Demon". He is a machinist, builder, steam engine restorer and mate of the first order. Geoff surprised me with this, it just showed up unannounced in Feb. 2012. I was blown away by his workmanship and generousity. First an explanation of what a "Chuff Pot" is for a reader asking "what the heck is that???" You route the exhaust from a toy/model steam engine to the chuff pot to capture condensate and spent oil vs. getting oil sprayed everywhere and possibly getting burned by hot steam shooting out the engine exhaust (straight out as it does on a Jensen particularly). As a bonus you get a bit more of a throaty tone from the tall stack that sits atop the "pot". I added the walnut wood base to further enhance a nice presentation. Geoff's design permits two inputs for twin cylinder motors (or plug one to run a single cylinder), an overflow cup in case the pot gets too full and a topside drain plug from which you suction out the waste condensate/oil when a run is done. Geoff also sent along an Australian dollar coin and I couldn't resist, I recessed it into the wood with the "roo" side up to give it sort of a maker's mark. The whole thing looks grand and it works perfectly. How many steamers have such an elegant solution to handling waste condensate and oil? It doesn't get better than this!!! THANK YOU GEOFF ! The video that follows shows the chuff pot hooked up to the twin exhaust outputs of a Jensen 55 engine.